I spend a lot of time building virtual networking tiers using VMware NSX, and so I wrote a few PowerShell scripts that automate the build and removal process and open sourced them on GitHub here. I’m by no means a wizard at this sort of thing, but I’ve tried to make the code as clean, commented, and error-handling friendly as I could within the past few rounds of commits. PowerShell 4.0, because I like the Invoke-WebRequest cmdlet. PowerCLI 5.x (tested with 5.8), required to pull the vCenter MoRefs for the NSX API requests. I’m open to better ways to do this to avoid needing vCenter at all. The script builds a pretty standard switch > router > transit > edge topology, nothing all that fancy. Here’s a delightful Visio with some sample subnets added as examples. However many logical switches you desire. 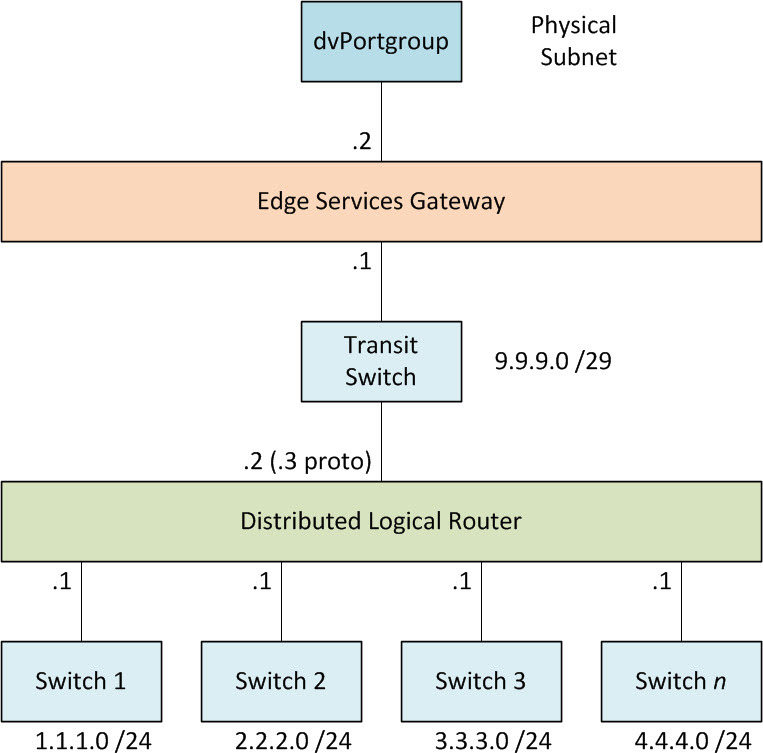 A distributed logical router for the mentioned switches. A transit switch to bridge the router to the gateway. Trimmings: Interface addresses, SSH access, dynamic routing with OSPF, etc. Love the resources that are available to all of us on GitHub. Thanks for posting your code and your blog Chris. Great way for network engineers on vSphere to do funny stuff without the need for much networking hardware. Another helpful (automation) way brought to us by Powershell and of course with Chris for sharing this article. Ty Chris! Nice script. Gotta love powershell! Hi Chris, i’ve been trying to use your script, but have found that the switches get created and appear in the NSX GUI, but aren’t visible via the NSX API. Have you got any ideas what’s going wrong? Aha, never mind, I’d reached the default limit of 20 items shown, had to add ?pagesize=30 to the url see the new items. Hi Chris, I’ve been trying to extend this scripting to update the vnic configuration of an Edge, and keep hitting a wall. There doesn’t seem to be any API way of just changing an Edge vnic, and the way the scripting works with Invoke-WebRequest -> XML it creates an object without the “CreateElement” method, so I can’t add in the extra entries – presumably this is why you’ve ended up creating raw XML. Any suggestions? Hmm, I’ve not done any work with modifying vNICs on an Edge. What is it that you’re trying to do? Maybe paste your code to a gist? I was trying to just “PUT” the specific xml to attach a Logical Switch to an Edge interface, but the only way to do this seems to be to GET the current config, modify it to change the “empty” vnic entity and submit the xml back. The $body is then a fully editable xmldocument rather than the xmlelement you start with. hmm… doubled the brackets and it just shows them as double. WTF? anyway, I think you get the gist!